Do you love The Da Vinci Code? 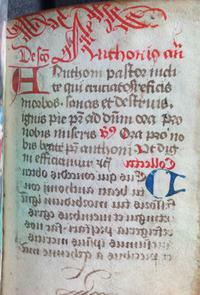 Have you ever wished you could uncover a secret code in a medieval manuscript? Exciting news! Your wish may come true! Take a look at the image of a 15th-century prayer book on the right and see if you can tell what’s strange about its text. The manuscript is written by hand in Latin and the text at the top of the page is written right to left, instead of left to right. It’s easily deciphered by using a mirror. The latin text is a prayer to Saint Anthony and its first few words read: "Anthoni pastor incliti." 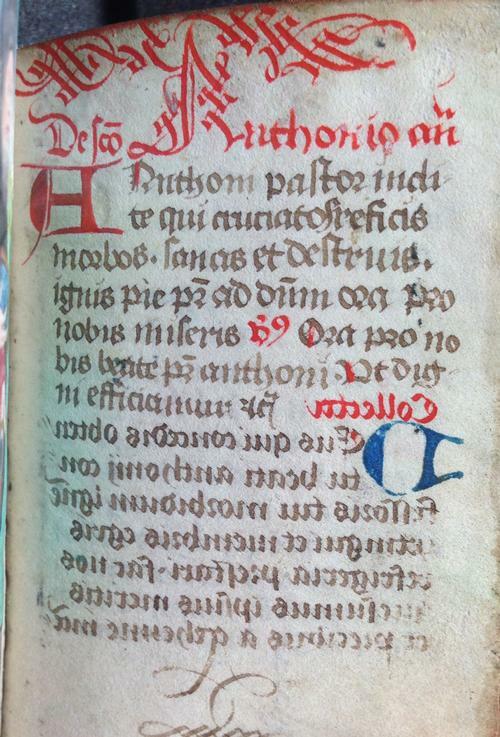 A full-page painted illustration of the Saint, called a "miniature", is included on the page next to the prayer. "Mirror writing" was not uncommon in the Medieval and Renaissance eras. In fact, Leonardo da Vinci (1452- 1519), the famous Italian painter and inventor, wrote most of his notes in this manner. There are many theories which try to explain why da Vinci and some medieval scribes, people who copied documents before the invention of the printing press, used mirror writing. Some believe it was a sort of secret code while others believe that the writers were left-handed or dyslexic. 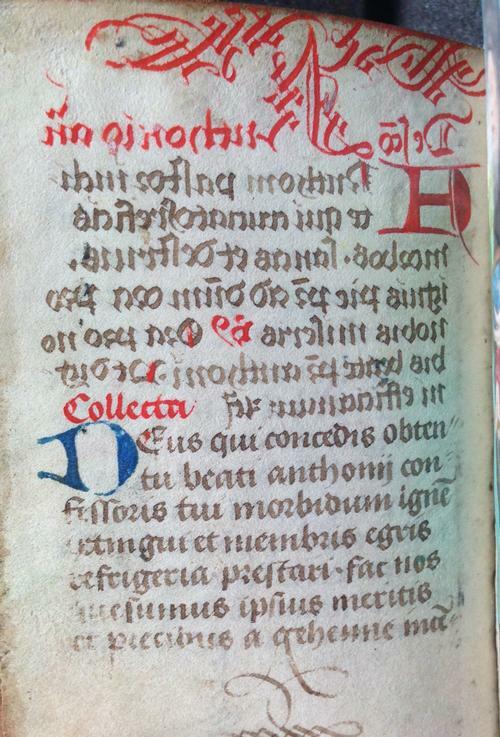 Perhaps the scribe of this manuscript wrote the prayer right to left to distinguish it from the rest of the text or to convey some sort of special meaning? What do you think? This medieval prayer book is one of many spectacular manuscripts housed in the Rare Book Department of the Free Library of Philadelphia. The collection includes some 50 Books of Hours from the 15th and early 16th centuries, Bibles, Psalters, antiphonaries and graduals, missals, writings of the Church Fathers, and other religious texts. 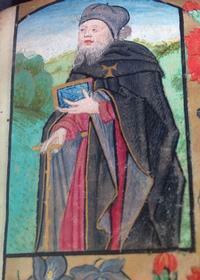 As part of the Bibliotheca Philadelphiensis: Toward a Comprehensive Online Library of Medieval and Early Modern Manuscripts in PACSCL Libraries in Eastern Pennsylvania and Delaware project, the Free Library is making more than 200 of its medieval manuscripts digitally available to the public. Eventually, all of the high resolution images and metadata created by the project will be freely available (yes, free!) 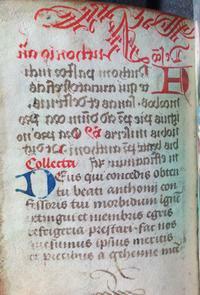 on OPenn, a manuscript portal hosted by Penn Libraries. If you’re interested in learning more about the Bibliotheca Philadelphiensis project or want to see more images of the region’s medieval manuscripts, check out the BiblioPhilly Tumblr page and the #bibliophilly hashtag on Facebook, Twitter and Instagram. I will continue to post additional images and updates on the project via this blog! Add a Comment to Mysterious Manuscripts and "Mirror Writing"